Sometimes you need a shoe that does it all. For men, it can sometimes be a daunting task. You want to look good but you want to be comfortable too. Let us introduce to you the re-souL leather sneaker collection. Leather uppers are dressy enough to get away wearing them to work but comfortable to walk in all day. Here is how we suggest wearing them. On occasion, you want to have the ease of no laces, especially at the airport. You can keep your cool through security and look put together for your trip at the same time. We would wear our green “Lance” slip-ons with our favorite denim. Too hot to wear pants but not really into wearing sandals? A simple solution is to wear your favorite cargos and a light t-shirt with our tan “Larry” lace-ups. That way you can walk for miles and still look perfectly put together. For this week’s What to Wear Wednesday we thought we would feature a boot for the guys. Men typically like to wear shoes, not boots. An oxford seems the safest option for most men. But the right boot is just as versatile as a shoe if you know how to play with materials and proportions. 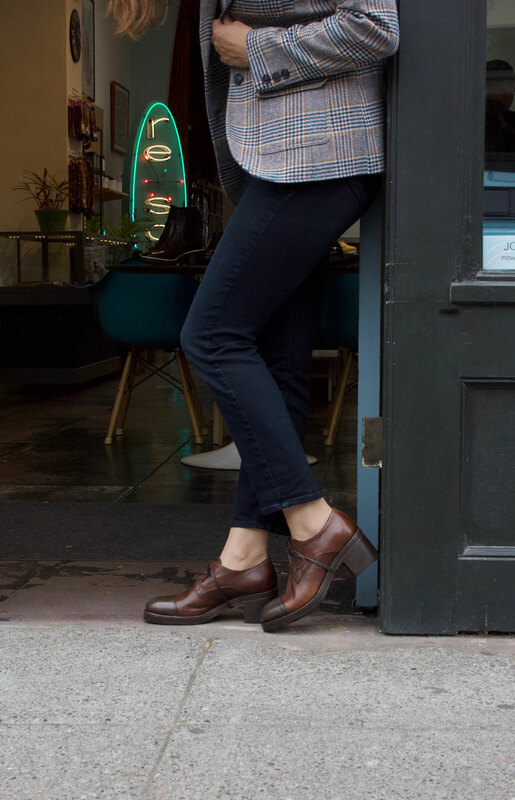 Pants that are narrower in cut and heavier in weight, easily can make the transition to an ankle boot. This Fiorentini and Baker G04 boot would be great with a pair of jeans, a sweatshirt and a quilted jacket. For a more casual/dress option, a heavy flannel trouser with a plaid shirt and blazer would be another winning combination. So gentleman, we encourage you to get out of your comfort zone and try wearing some boots! > Fiorentini and Baker “G04” leather ankle boot, made in Italy. > Men’s Stance “Alpaca” socks, wool blend. Imported. What do I wear with JD Fisk “Cadet”? This week we feature the JD Fisk “Cadet” for men. Hello gentlemen. This week we pay some attention to you guys for “what to wear Wednesday”. We know you like your chucks and sneakers because they are easy to wear, but what if you could have the same comfort level and look stylish too? This sneaker by JD Fisk with its clear vulcanized sole and leather upper is comfortable as well as handsome. Wear them with your favorite Fall staples; jeans, denim jacket, sweaters and a quilted vest or jacket. > JD Fisk “Cadet” black leather sneaker. > In God We Trust “Wednesday” leather bracelet, contact for availability. Inspiration images via Falconari and The Sartorialist . To view the other items featured along with their links as well as more outfit pairing suggestions, check out re-souL’s profile on polyvore. 1. Le Freres Joachim looking great in his camel coat, “Addison” 1000 Mile boot by Wolverine. 2. Image of Barbour quilted jacket via Manolo.se and “Bolter” boot from Bed|Stu Cobbler collection. 3. Image of grey layers via SDouble Design Shop with Style #56301 boot by MOMA. This Fall there are plenty of men’s trends that are worth a look, but if we were to pick one shoe to add to a gentleman’s closet, it would have to be the lace-up boot. A timeless staple that can be dressed up or down, this silhouette is a must-have for any guy’s wardrobe. We have paired them with 3 different key menswear looks to show the versatility of this classic style. 1. The Camel Overcoat – Sharp and versatile, a classic camel coat is timeless. What better way to accessorize your coat than with a pair of Wolverine “Addison” boots. The cognac brown color is rich and it can make a wool suit look a little bit more relaxed. 2. The Quilted Jacket – Puffer coats have been on the scene for a few seasons, but its sleeker cousin is the right jacket to wear for those crisp fall days. Throw it over your favorite heavy sweater or blazer for extra warmth and wear it with your favorite jeans. To finish the look we like the “Bolter” boot by Bed Stu, an urban work boot that’s big on style and very practical. 3. Gray on Gray Layering – A fresher way of layering than wearing all black, the gray on gray color scheme works well because of the different textures and patterns. Notice the gray herringbone tweed over the gray melange sport coat and fleece shirt? Of course to finish this look you need a pair of boots from MOMA. This boot is rugged and polished at the same time and subtle antiquing of the leather gives them timeless style. So what are you guys thinking? Ready to move away from zippers yet? To see more menswear inspiration, checkout our Pinterest board Style: The Gents.